EURO 2016.....and TROX is right there! You can't miss it. It is on TV, the radio and all over the internet; it is THE topic the whole world is excited about. We love nothing more than discussing the highs, and lows, as nothing seems to move us more. What are we talking about? You guessed it: the 15th European football championship, EURO 2016, which takes place in France from 10 June until 10 July. More than 2 million tickets have been sold for the 51 matches which means that millions of visitors will descend on the ten stadiums. Needless to say this requires extraordinary efforts with regard to the ventilation and air conditioning. The stadiums are very ambitious building projects. Bordeaux, Lille, Lyon and Nice boast brand new stadiums, while the Parc des Princes in Paris has been revamped. Our colleagues at TROX France have contributed to the new stadium in Bordeaux, an arena for 42,000 people, built by the Vinci-Fayat consortium. TROX have also provided VAV terminal units (Type TVR and Type TVT with Easy controllers) as well as AK shut-off dampers in order to ensure the safety of the visitors and let them enjoy the matches in a comfortably ventilated stadium. Football fans in the Bordeaux stadium will have nothing to distract them and be able to fully concentrate on the five matches. With a number of home nations involved we are all looking forward to four weeks filled with excitement, great matches and the usual emotional roller-coaster ride. TROX is leading in the development, manufacture and sale of components, units and systems for the ventilation and air conditioning of rooms. With 29 subsidiary companies in 28 countries on 5 continents, 14 production facilities, and importers and representatives, TROX is present in over 70 countries. 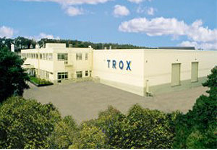 Founded in 1951, global market leader TROX, whose international head office is in Germany, generated in 2015, with a total of 3,700 employees around the globe, revenues of €482 million.